Deriving its architectural inspiration from the abundance of Uganda’s lakes and rivers, the hotel has been established around a central water theme, which exhibits itself both in the extensive water gardens and in the hand-carved panels and shimmering mosaics with which it is decorated. 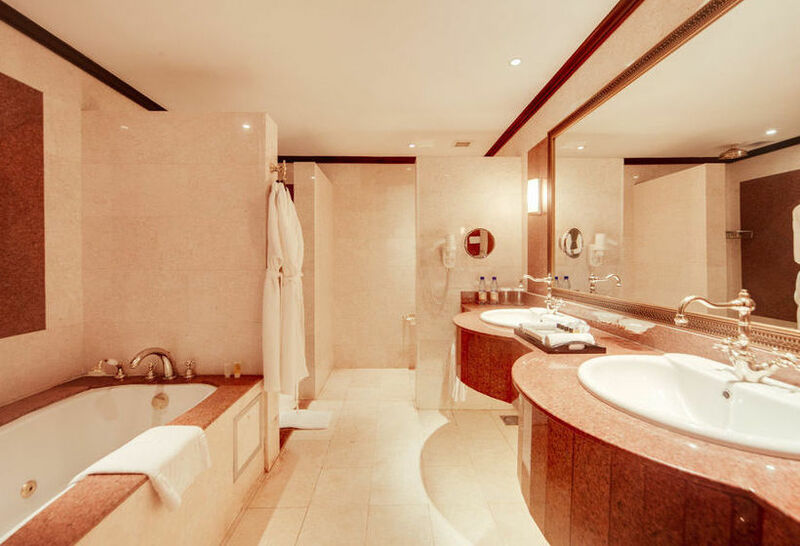 In regard to accommodation, Kampala Serena Hotel has 152 rooms that offer business friendly facilities with 5 star modern and luxury amenities and services. The hotel offers a wide range of rooms and suites, all of which are elegantly presented in a fusion of international and Ugandan style, and all of which have private balconies or terraces. 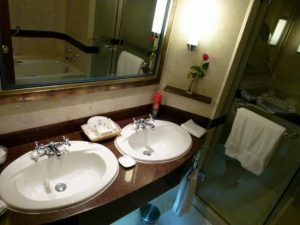 The accommodation choices in the hotel are some of the finest places to stay in Kampala city and the following are some of the room types found in the hotel. All the hotel rooms and suites are equipped with features such has 24-hour room service, air-conditioning, Wi-Fi and in-room modem hook-up, direct-dial phone, voice-mail, complimentary newspaper, in-room satellite TV, mini bar, private safe, 240V/3 pin (square)sockets and shaver sockets, tea and coffee-making facilities, hair driers, bathrobe and slippers, porter/concierge, airport shuttle and limousine service. The hotel’s exclusive Bambara Lounge is only open to the hotel residents and offers a modern lounge with newspapers, periodicals and café service as well as a Bedouin-tented outdoor terrace and meeting area. Additionally, our residents are invited to use the extensive services of our Business Centre, which offers a complete range of technological support and a series of private board rooms. In terms of dinning, Kampala Serena Hotel provides a world of dining and entertaining options including some of the best restaurants in Kampala. Visitors have choice to choose from the stunning gourmet restaurant, The Pearl of Africa, The Explorers Italian, The Lakes, All-day international restaurant and the sparkling Pool Terrace. 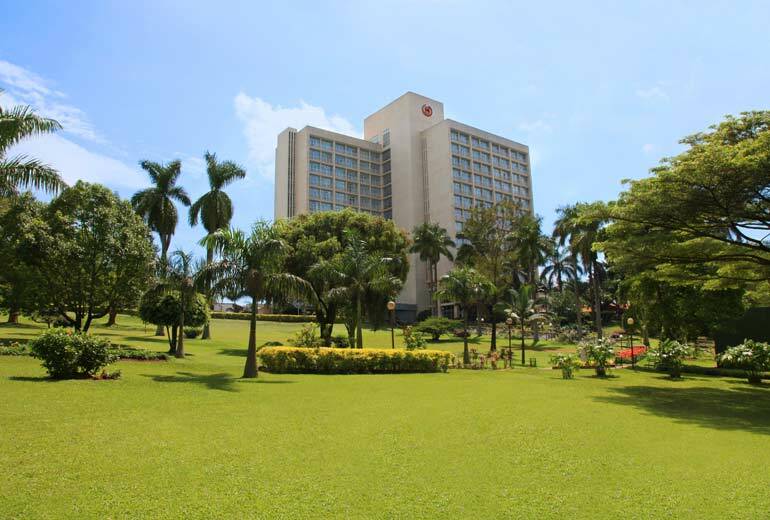 Sheraton Kampala Hotel is luxury hotel situated on the southwestern corner of famous Nakasero Hill in Kampala. The hotel belongs to the International Sheraton Hotel Chain. Situated at distance drive of 40kms from Entebbe international Airport, Sheraton hotel is the best hotel to take a magnificent view of the city or the famous Kololo and Nakasero hills especially from the 233 hotel room which are apportioned as 112 Classic rooms, 51 Executive, 37 Club rooms, 21 Diplomatic rooms, 30 Suites and 3 Presidential Suites. The hotel rooms are decorated with a local flavor and homey comfort. 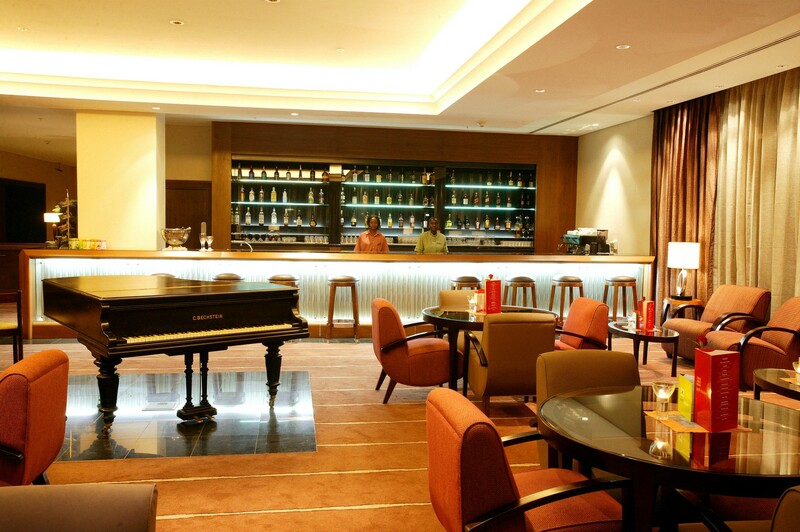 Sheraton Kampala Hotel also has wonderful bars and restaurants perfectly set in the hotel. Among these include Paradise Grill restaurant located by the breezy botanical gardens and offers mouth-watering themed lunches & dinners from around the world, every day. The stylish Victoria Breakfast Room which is open every day and famous for its American buffet breakfast that can be enjoyed on the terrace overlooking the gardens. The Park Square restaurant serves visitors with aroma of freshly brewed coffee and delicious pastries in the lobby. The Pool Bar considered to be the best place to relax, especially after a swim in the circular Kyoga pool. The other bars in the Hotel include Rhino Pub, Temptations and Equator Bar and all these make your stay in Kampala a life time experience. This most popular hotel in East Africa also offers a broad variety of events and meeting facilities in its own meeting rooms and conference halls. The Rwenzori ball room can extend to accommodate over 450 participants while other meeting rooms can accommodate 12 participants each. This world class hotel is located along Kintu Road on Nakasero Hill, in the Centre of Kampala business district. Imperial Royale Hotel was opened in 2007 with an idiosyncratic design and style that has never been in Kampala. The hotel is strategically positioned next to Sheraton Hotel and Serena Hotel, thus providing traffic free access to government offices, diplomatic missions, banks, airline offices and shopping malls, Markets, Bus parks among other interesting places within the City. This gem of a hotel consists of 274 rooms partitioned as 149 deluxe doubles, 55 deluxe twins, 36 Executive doubles, 24 Executive suites 8 Governor Suites and 2 Presidential suites. All bedrooms in the hotel are all fully air conditioned and are exquisitely furnished to match international standards. Each luxurious room has a work desk, large plasma screen T.V with in house video & satellite cable programs, direct dial telephone, and en – suite bathrooms with separate shower cabin, bath tub . The rooms are serviced by five elevators for easy movement of visitors. The hotel has 3 restaurants namely Chopstix Restaurant that serves Indo/Chinese Dishes , the Royale Restaurant and Rumours dubbed the latest “happenings” place of Kampala. In terms of Conference and Meetings, the hotel has 20 conference halls to suit different needs, ranging from 50 seats to up to 2,000 seats, Imperial Royal hotel has the largest conference facilities and guaranteed parking for over 500 cars. 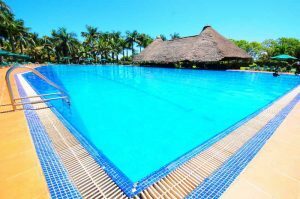 The hotel’s ultra-modern health club, including an Olympic size swimming pool is situated on the fifth floor of the hotel overlooking the beauty of the Kololo Hills. The hotel was designated “The Media Hotel” during the Commonwealth Heads of Government Meeting (CHOGM) in November 2007 in Kampala and carried out its function to the satisfaction of over 400 International journalists who covered the event. The Royale Wellness Center has the latest Gym equipment, aerobics room, massage rooms, his & hers steam & sauna rooms, swimming pool and a very experienced team of instructors to keep you toned up. Speke Resort Munyonyo is a luxurious Hotel that was established to accommodate the visiting Prime Ministers and Presidents at the 2007 Commonwealth Conference (CHOGM) in Kampala-Uganda. Accessed within distance drive of 12 km from the capital Kampala, the hotel enjoys blissful setting on the shores of Lake Victoria. This marvelous hotel situated in the heart of Uganda provides visitors a choice of luxury accommodation that suits individuals, couples, families or groups on long or short Uganda Safaris. The Resort has 59 Presidential suites with a unique combination of traditional Ugandan décor and ultramodern furnishings, in addition to cottages, one bedroom and two bedroom apartments or studio rooms. Bar, and restaurant which serves both Local and international drinks. Emin Pasha Hotel is located on Plot 27 Akii-Bua Road, Nakasero. It is Kampala’s first boutique hotel that releases elegance and comfort whilst eliciting the taste of a bygone era. The charming hotel aims at establishing a balance between the colonial era glamour with current elegance enjoyed by the travellers all over the world. The hotel amalgamates tradition seamlessly with the modern styles, from the architecture to the furnishings and the modern amenities. Perfectly situated close to Kampala business Centre, the hotel is lying on two acres of picturesque tropical gardens and hence making it the only place offering privacy and serenity in Kampala frantic city. There are 8 garden rooms, all located on the ground floor offering a small outside sitting area facing the gardens or courtyards, en-suite bathrooms with either slate-tiled tropical showers or deep long baths, air-conditioning, television, internet access and direct dial telephone. The hotel also has 2 garden suites which are also on the ground level and are spacious in size than the standard rooms and have a lounge area along with the other amenities offered in the standard rooms. Emin Pasha Hotel also consists of 8 superior rooms and these are located on the upper level with French doors opening to allow exclusive views over the green gardens or courtyards. All the rooms are equipped with air-conditioning and have en-suite bathrooms, internet access, television, direct dial telephone, and mosquito nets over the beds. Lastly, the two Superior Suites are also on the upper level and offer the same as the Garden suites. In addition, the hotel has 2 Superior Suites and these are positioned on the upper level. They are large with the view of the gardens and the swimming pool. They also have the following features; bed, En suite bathrooms with both slate-tilled tropical shower and claw-foot tubs, Air conditioning, Wi-Fi internet access, Mini bar, Mosquito nets, Flat screen Television, Espresso Coffee Making machines and Mini bar. Emin Pasha is the ideal base from which to explore the capital city of Kampala or for an overnight stop. 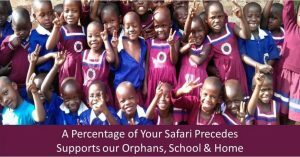 Alternatively it offers a starting point for an adventurous Uganda safari; guests can acclimatize to the time and the weather before setting off upcountry. It also is a civilized and welcome end to a long dusty journey. With a large range of treatments on offer the spa is on hand to assist with relaxation. Situated along Yusuf Lule road and on the edges of Uganda Golf club Kitante, Golf course Hotel is unique and luxurious accommodation place in Kampala offering a wonderful design, world-class facilities, and flawless services. The most popular hotel redefines guest’s expectations for accommodation in Uganda. The hotel five (5) room types namely Deluxe, Family suite ,Executive, Business Suite, Honeymoon Suite in addition to the 6 Holiday Apartments and 3 executive Villas. All the hotel rooms come with an additional features such as Air conditioning, Hair Driers, In-room Satellite TV, Direct dialing telephone system, Hotspots for Wireless Internet Connectivity, Mini bar and Private Safe, Coffee/Tea making facilities, Reading table, a daily local newspaper, magazines and visitors seats coupled with a 24 hour Room Service, Laundry Services, Valet Services and a walk-in wardrobe. The hotel also boasts of three different restaurants serving a range of Continental cuisine, Steak Ranches and Mexican specialties and traditional local dishes. 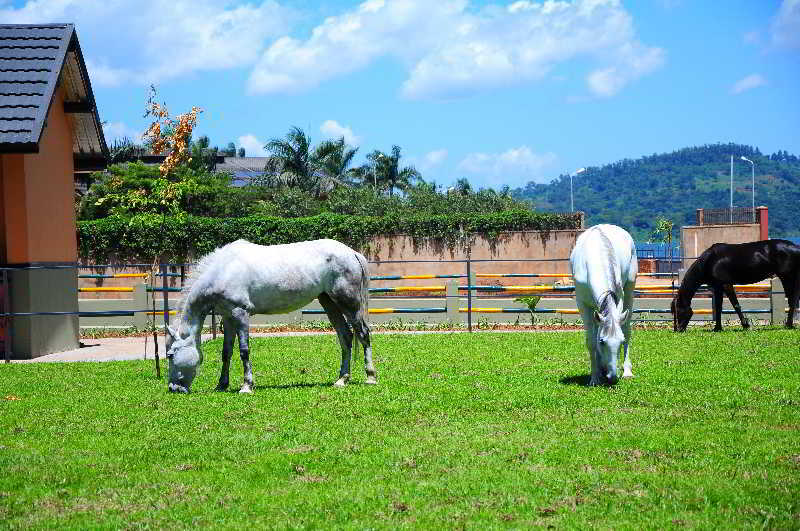 Among these include 7Hills Revolving Restaurant, Silver City Spur and Bamboo Terrace. The hotel also has Fitness Centre dubbed Garden City Fitness center and its situated in Garden City Level 3 overlooking the prestigious Uganda Golf Course .The Centre is fully equipped Techno Gym with a fitness arena, Aerobics zone, free weights section, Swimming pool and Jacuzzi, Sauna, separate steam birth and physical massage, Spin biking, health bar, we undertake corporate and family memberships. In regard to Conference and Banqueting facilities, the hotel has 3 meeting Rooms and one conference/banquet hall which are ideal for international Conferences, Board Meetings, Seminars, Conventions, Trade Fairs & Exhibitions, Weddings and Cocktails. The Golf Course Hotel is the best accommodation place for your treat to an exciting new address, to a peaceful environment and celebrated executive facilities. Being the only luxurious hotel near the picturesque Kampala Golf Course, the hotel provides savvy visitors a pleasant alternative to traditional Ugandan hotel.